BANGKOK — In its 34th year, the Bangkok Gems and Jewelry Fair has evolved into a larger, more organized, more diverse, and more international event that is attempting to back the organizers claim of being one of the top five gem and jewelry shows in the world. The fair, being held Sept. 12-16 at the sprawling Impact Center on the outskirts of the Thailand’s capital city, is changing from a show predominately focused on gems and price-based jewelry manufacturing to one that increasing becoming a place where buyers can also find a broad range of high-end jewelry and jewelry services. Gems will always be the focus of the show, which was evident by the fact that the area dedicated to gems drew the largest crowds during the first three days. Overall, the number of attendees hasn’t appeared to keep up with the growth of the show. Crowds were steady throughout the show’s first three days with afternoons being busier than the mornings. In addition to the quick growth the exhibit space, Amit Dhamani, managing director of Dhamani Group of Companies, Mumbai, India, a jewelry manufacturer and retailer, noted that crowds weren’t large as they could have been because the Bangkok show was taking place at the same time as trade shows in Italy, Spain, and Hong Kong. “I think it’s okay, there isn’t much to get excited about,” says Johann Viljoen of World of Gems & Jewellery, Windhoek, Nambia, which is involved in mining, cutting, jewelry manufacturing, and wholesale and exports. 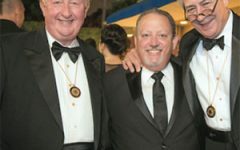 Ershad Sheik of Millennium Design, which manufacturers mass market jewelry in the U.S., is attending the show for the second year. He says he is beginning to create lines of high-end jewelry for the European market. He is using this show to showcase his new designs to the large number of Europeans who attend the Bangkok show. Overall, the show now exceeds 1,000 exhibitors using 2,800 booths, an increase of more than 200 booths from the previous year. The exhibit space now measures 645,800 square feet. Approximately 30,000 buyers of gems and jewelry are expected to attend the five-day fair with the three days open only to the trade and following two days open to the general public. For the first year, all the exhibit space was organized on a single floor and separated by eight halls, with halls seven and eight being the result of the Impact Center’s recent expansion. Attendees are able to walk the entire show without leaving the space. Hall 1 houses equipment and tools and International Pavilions. Hall 2 also has International pavilions along with pearls and diamond jewelry and body jewelry exhibitors. Hall 3 contains costume jewelry and gemstones. Hall 4 is dedicated to gemstones. Hall 5 is dedicated to gold jewelry. Halls 6 and 7 contains gold and silver jewelry exhibitors. And Hall 8 is dedicated to silver jewelry. In addition to the show’s breadth and organization, the Impact Center is now a more comfortable place to do business with a large amount of computers with Internet access throughout the exhibition hall for public use and several “VIP lounges,” where buyers and suppliers can meet over coffee, tea, and snacks. There are also several high quality restaurants on the premises along with food courts selling Thai food.